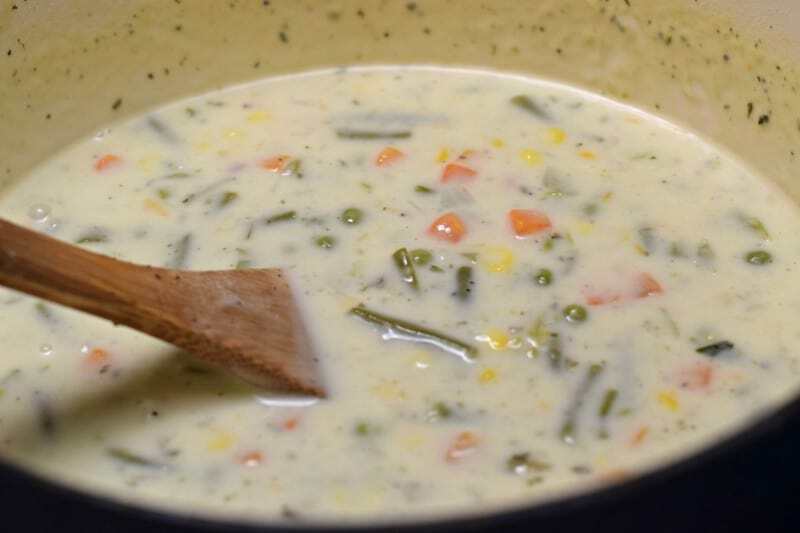 This Low Carb Creamy Vegetable Soup is a creamy, deliciously flavorful soup to start out your meal or be a meal all by itself! My husband and I have been eating low carb for a couple of months now and collectively we’ve lost right at 70 pounds (40 for me, 30 for him). You can read more about how we eat by visiting this post – be sure you scroll through to the bottom for lots of info. I’ve found some clever work arounds to make traditional recipes more carb friendly and in this post I’m going to show you a great little secret for thick and creamy soups by using a non-traditional thickener. This is a soup I’ve made for years, ever since I tasted the delicious creamy vegetable soup at the Dixie Stampede Dinner Show. Normally, I add milk and flour to it, both of which are off limits on a low carb diet. In their place in this recipe, I use heavy cream and a non traditional thickener that out performs flour and even corn starch. If you want to skip ahead to the recipe, scroll down to the ingredient picture. If you’d like to visit a while, grab a glass of tea and keep reading. Ricky and I just got back from a weekend trip together. This was a business trip of sorts but it was significant because it was the second time we’ve gone away without kids since, well, kids. About eighteen years, give or take. We’ve never been big on babysitters and we’ve always felt we needed more time with our family rather than less so this has worked out great for all of us. We have more of an old fashioned family life – rather than leaving the kids with others while we go galavant, we take them with us and do our catching up one on one over early morning coffee – or evening coffee – or midday coffee. Okay, so coffee is a big part of our relationship. But now that the kids are both older and don’t “need” us as they used to, we are beginning to explore the world without them a bit in preparation for the next chapter of our lives. 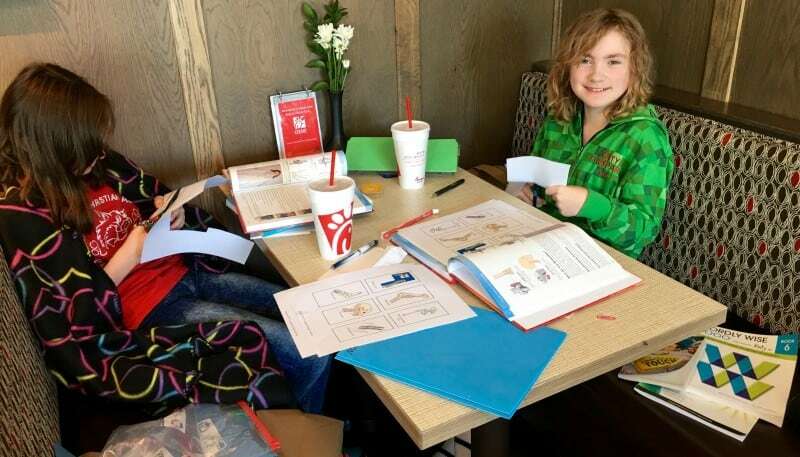 As I type this, I am at Chick Fil A with “my girls” having what we affectionately refer to as “Chicken School”. Every now and then we come to Chick Fil A with all of our books, have breakfast, do school work, have lunch, and head home. It’s great to have a change of scenery and the crazy thing is how much more focused and efficiently they work when we are here – we get twice as much done in half the time. They work so well here that if I could afford it, we’d come every day! I guess at some point I really should get into the recipe…. 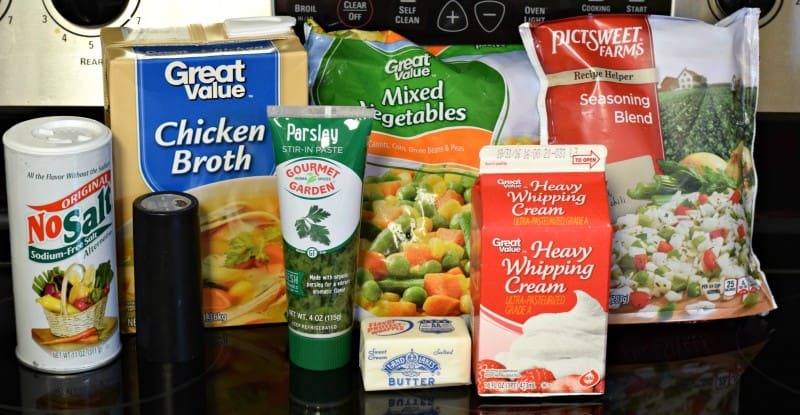 You’ll need: Salt*, Pepper, Chicken Broth, Parsley (fresh or dried), Frozen Mixed Veggies, Butter, Heavy Cream, and Frozen Seasoning Blend (or chopped onion). Little Tip about Potassium – *I am using NoSalt because now that I am eating low carb, bananas are out of my life and I have some serious potassium needs. No Salt is basically granulated potassium. Just 1/4 of a teaspoon of NoSalt has more potassium than a medium sized banana and over six times the amount of potassium that the FDA allows in a potassium supplement – so I’m sticking with NoSalt. 🙂 As long as I have this in one of my meals once a day or so, I don’t have those dreaded charley horses in the middle of the night. When I forget and start having issues, I just mix up a glass of some type of no calorie/no carb drink and add in 1/4 teaspoon of NoSalt for a little homemade gatorade type drink and I’m good to go again. It’s not a bad idea to take a good multi vitamin as well. Carby veggie alert: Yup, some of these veggies you see are higher carb than others. Corn, peas, carrots, etc. Use your own judgement based on how low you are trying to keep your carbs when choosing veggies for this soup. Lower carb option are broccoli, cauliflower, green beans, etc. To begin with, melt your butter in a pot or dutch oven and place your onion-ish veggies in it. Saute these over medium heat until kindly* tender and onions are translucent. *Kindly is a word my grandmother used in place of “kind of”. I love that word :). 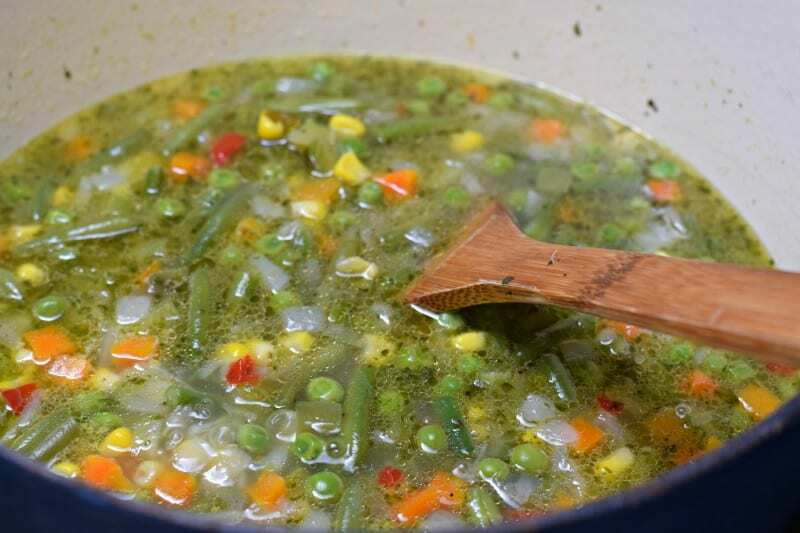 Now add in the frozen veggies and broth and cook this on medium high or medium until the veggies are tender. Once this comes to a bit of a simmer that should take about ten minutes or so. Add in heavy cream and season with salt and pepper to taste. Note: a little extra salt goes a long way when it comes to flavor so don’t skimp, but do taste as you go so as to not overdo it. At this point there are several things you can do. Option 1: Stir in a handful of instant potato flakes. This is one of my favorite soup and stew thickeners but definitely not low-carb friendly. Option 2: Quickly stir a tablespoon or two of flour up into about 1/2 cup of water to make a slurry and stir that in. However, this is not on the low carb “great idea” lists, either. Option 3 (Carb friendly! ): Today I am using this amazing thickener called Glucomannan. I buy this from Amazon and it is about $12 for a bottle that will pretty much last you a generation or two (I’m exaggerating but you get my point – click here to see this on Amazon and learn more). Glucomannan is the powdered form of a root that acts as an amazing thickening agent. It also makes you feel pretty full for a good length of time so whenever I use it in a recipe I find that I get that full feeling much faster and generally can’t eat nearly as much as I normally would. There is a lot of research out there that shows this fiber is very diabetic friendly when it comes to lowering glucose levels and such but that just needs to be something you research on your own – I’m here to show you how it works. To use Glucomannan as a soup thickener: Add 1 teaspoon to one cup of cold water. Stir well and then stir into pot of soup. In this demo, we are adding 2 teaspoons to 1/2 cup of cold water just to show you what happens. You have to put this into COLD water because it seizes up and forms lumps in hot water. Stir that in, let it sit a minute, and BAM! Gel. So what we need to do to use this as a soup thickener is not let it get that thick. Make sure you follow the instructions and amounts in the recipe below. I also use this when I make smoothies for a thicker, more ice cream like consistency. It is a non-traditional ingredient but after using it a few times it has become a favorite in my little bag of cooking tricks. ALWAYS start with way less than you think you will need. Example: for a smoothie, I’d use no more than 1/4 of a teaspoon, maybe even an 1/8. Either way, stir that into your soup, let it simmer about ten more minutes, and dig in! Enjoy your low carb soup. If you use Glucomannan in it, get ready for a very filling meal! Melt butter in dutch oven or soup pot over medium high heat. Add onion blend (or just onion) and sauté until onion is tender, about 5 minutes. Pour in chicken broth and frozen veggies. Bring this just to a boil and then reduce heat to a simmer until veggies are tender, about ten minutes. Add in heavy cream, parsley, salt, and pepper. Stir well and continue to simmer. 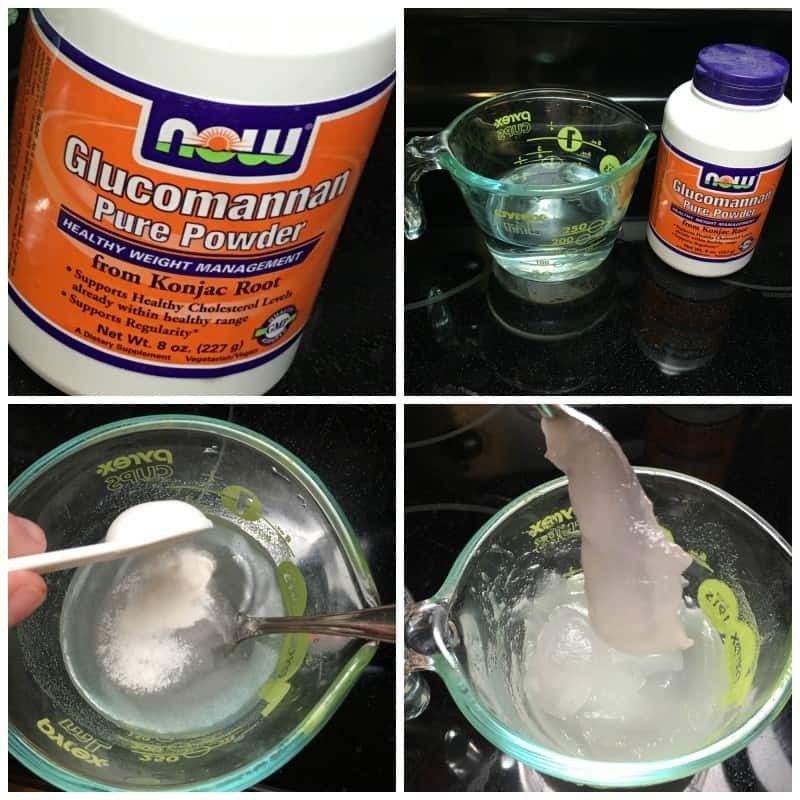 To thicken with Glucomannan: In a measuring cup, stir 1 teaspoon of Glucomannan into a cup of cold water until dissolved. Stir this into the soup and continue to simmer for about ten minutes more, stirring from time to time. To thicken with flour: Stir one tablespoon of flour into one cup of water and then stir into soup. Continue to simmer for about ten minutes, stirring from time to time. Looks great! I think I’ll try it this weekend. I hope you like it as much as I do Cindy!!! Have a great weekend!! Thank you for the tip about No-Salt! I never would have imagined that’s what it is, and now I’m going to buy some. And that thickener, too…have to do a little research to see how it does what it does. Thanks! Oh my goodness, No-Salt is one of my must haves! Thanks for the No Salt info. Glucomannan is wonderful! I discovered it from Trim Healthy Mama forums and it works so well. Really adds something to my soups. I will be sure to try your recipe soon. It looks really good. 🙂 I hope you get the chance to soon Pam, hope you love it as much as I do!! I will have to try this soup. My daughter fell in love with this soup at the Dixie Stampede a couple of years ago, and she is a very picky eater. She has been wanting me to order the mix from them, but I refuse. Congrats on the weight loss, I so need to join you. Do have this recipe posted somewhere in a regular version? I would like to try it. Thanks! The soup sounds great! How many servings or cups does it make? Thanks for the great tips about No Salt and especially Glucomannan. 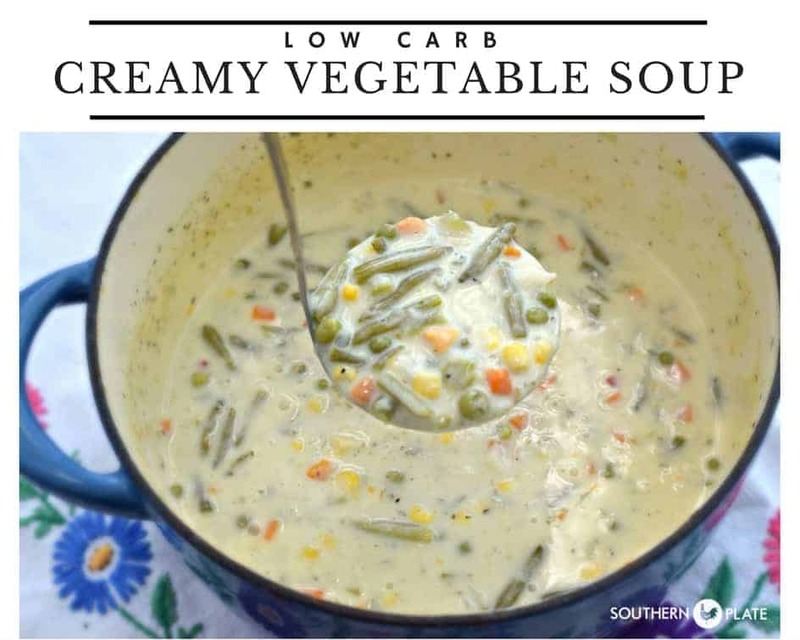 Thank you for this delicious low carb and creamy soup! I have Glucomanan on hand, and will definitely give this a try. Thank you so much for sharing. My mother loves the soup at the Dixie Stampede and so do I. She’s currently undergoing chemo treatments for breast cancer and I think this may just be the pick-me up she needs. I can’t wait to make it for her. Looks great! I could see adding in some shredded chicken…..
*kindly* – I love it! Reminds me of some of the things my Mamo would say. How many carbs does this have? On Atkins, carbs have to be extremely low. thank you. it looks delicious. the gravy, just makes it that much richer. 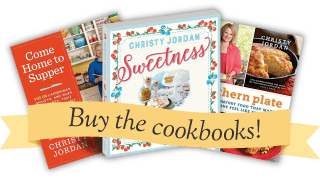 Christy, Love that you are including Low Carb recipes….I am low carb too. The No Salt product that you mentioned, where did you get that from? I agree with Teresa – think shredded chicken would give it some protein. Sounds yummy! Thanks again Christy, I so appreciate your attitude and recipes!!! I’m so glad to learn about the glucomanan.. I’ve always just used guar, this sounds better and the NO SALT we have used for many years… have tried others but always came back to this one. Going to make this soup this weekend for sure.. YUMMY. I sometimes puree cauliflower when I’m making veggie s chowder, you get the taste & it helps with the thickening and creaminess. you guys are doing fantastic on low carb !! I am also doing it and really appreciate that you are posting Low Carb recipes. I used guarantee guar or glucomanan for a diet aid and to help stay regular. I also use nonfat powdered coffee creamer to cream soups. Thanks for the low carb recipes. Just starting out with low carb so constantly looking so I won’t keep eating the same thing over and over. Really appreciate the No Salt info have been bothered with foot and leg cramps and am definitely going to try this. Can’t wait to try this soup, I love the soup at Dixie Stampede too. Thanks also for the tip on No-Salt, have leg issues due to not enough potassium so hopefully this will take care of that too. Thanks for the tips on glucomana. I have had a bag setting nicely in the pantry for over a year. I tried it once by sprinkling on hot turkey broth to make gravy. Now I know how to use it. Thanks. I will be making the soup soon. It looks yummy. This recipe sounds wonderful. I am anxious to try the Glucomannan. I plan on making this soup for my husband and I. But I have a nineteen month old granddaughter who has a healthy appetite and will eat just about anything. She loves vegetables. Is this okay to use Glucomannan for young ones? Also, how do you salute the onions? How long do I have to stay at attention? LOL! There is misprint in the cooking directions, step 1. It just made be laugh. At first, I thought this was a new type of cooking term that is new to me. Thanks for all your great recipes and ideas. What AWESOME timing on this post!! I’ve just been diagnosed with diabetes & need low-carb recipes. Plus the tip about the NoSalt will help me lower my sodium along with my carbs. And if that isn’t enough, my mama told me that our big family Christmas dinner will be soups, salads, breads, & desserts this year. You have given me the soup I can take & eat!! Thanks for the wonderful recipes & the sweet personal stories!! Any ideas for substitutions for heavy cream? I am seriously lactose intolerant and have found work-around options for pretty much everything but that. Thanks for all your wonderful ideas and stories, Christy. It’s always like reading a note from a friend – with photos and a yummy recipe! Dairy and soy allergy here — if you can at all stand the taste of coconut in savory foods (turns out I can’t), you can use that. It has a much more creamy consistency. When cooking savory foods, I typically use unsweetened rice milk (almond milk, even unsweetened, cooks up sweet to me) and a thickener of some type for body. I might also add a spoonful of mayo if it seems like something I would have put sour cream or cream cheese in. This soup might also be a prime candidate for a can of pureed white beans or pureed cooked-to-death cauliflower for a “creamy” base. Note that a lot of dairy substitutes tend not to be low-carb, if that’s a primary concern. Have you tried pureed tofu? I read about that recently, but it’s still too flipping hot here to make soup so I haven’t yet had the chance. She CAN’T!! She’s ALLERGIC TO SOY!!! There is no reason to yell. Erin was just trying to be helpful. I’m really lactose intolerant. Are used whole lactose free milk and puréed cauliflower to thicken soups and it works great. Thanks for chiming in and sharing your tips with others Regan!! Thank you soooo much for this creamy soup recipe. My husband has just started a low-carb diet is well. I can see that the Glucomannan thickener will be a lifesaver for many of the recipes that I’ll be making for him and for me. We both love soup so thank you again so much for this wonderful recipe. also I love the idea of you using it as a thickening agent for a dessert type recipe with fresh fruit wonderful idea. I was curious though? Do you have any information on how many carbs might be a 8os. Cup of soup? Since my husband has just started this low-carb diet we’re trying to be very strict with the amount of carbs that he can have for a day . Delicious soup! I had some gravy left over from the Velvet Pork Chops recipe that I added to the soup. Yum! Oh my goodness, what a great idea!!! I have made this twice and we really like it. Have not been able to find the no salt in our area. We have been doing low carb (20 grams per day) since February. Hope you plan to share more low carb recipes in 2017! Yes, please do Christy!! There are lots of us eating low carb and in need of more low carb recipes. Congrats on yours and your husband’s weight loss. Awesome!!! Love this! I made pretty much the same recipe for my son who is doing low carb. I added chicken and called it chicken pot pie soup. He showed me how to use xanthum gum for the thickener. On another note- LOVE LOVE your tip on no salt! Great idea for those people who for whatever reason need potassium. Cindy, I use Xanthan Gum as a low carb thickener and am wondering if you would have an idea how much I would use in this recipe? I think I may start with 1/2 teaspoon. Thoughts? Hey! I think you’re asking me but if you are asking someone else I apologize! I’m afraid I’ve never used xantham gum as a thickener so I don’t know where to start but you can’t go wrong by starting low and adding more as needed. Is this soup freezer friendly? I always like to make individual servings as it is just me. 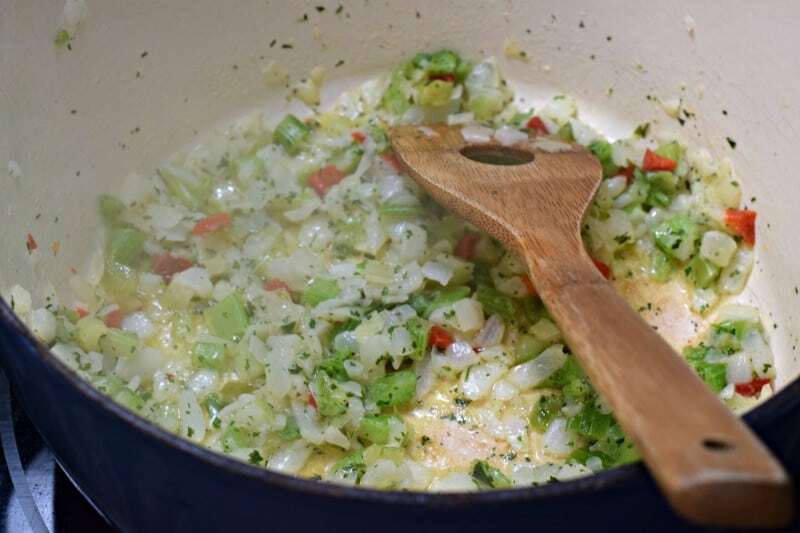 I have made a soup very similar to this one and it has done fine in individual servings in the freezer….That being said, I have not made this exact recipe so I cannot say for sure on this one. I hope you get the opportunity to make it soon Deloise!!! Two things to brag on today. First is this wonderful soup. With this frigid weather hanging on, I decided to try it and boy, am I glad. My bunch loved it! Second, I must mention my electric kettle that I got last Christmas (after seeing it on your list). When I went to wash my big pot to make the soup, I found that my hot water pipe was frozen. Then I remembered my kettle and discovered yet another lifesaving use for it – instant hot water for dishwashing! I blessed your name, let me tell you! Thank you once again! 🙂 I still use my kettle all the time, one of my favorite small appliances!! So glad you are loving yours! !